Aim and Objective: In this study, a new series of iminopyrimidine derivatives were synthesized from the reaction of the key intermediate 2-imino-6-phenyl-2,3-dihydropyrimidin-4(5H)-one 4 with a variety of electrophilic and nucleophilic reagents under a variety of mild conditions. The structures of the newly synthesized compounds were characterized on the basis of their elemental analysis and spectroscopic data. The antimicrobial activity of this series was evaluated in vitro and they showed either weak or moderate activities. Materials and Methods: All melting points were measured using Akofler Block instrument and are uncorrected. IR spectra (KBr) were recorded on FTIR 5300 spectrometer (υ, cm-1). The 1H NMR spectra were recorded on a Varian Gemini spectrometer. The 1H NMR spectra were run at 400 MHz and 13C NMR spectra were run at 100 MHz in DMSO-d6 as a solvent. The chemical shifts are expressed in parts per million (ppm) by using tetramethylsilane (TMS) as an internal reference. 1000 EX mass spectrometer at 70 eV. The purity of synthesized compounds was checked by Thin Layer Chromatography (TLC) (aluminum sheets) using n-hexane, ethyl acetate (7:3, V/V) eluent. Elemental analysis was carried out by the Microanalytical Research Center, Faculty of Science, and Microanalytical Unit, Faculty of Pharmacy, Cairo University, Egypt. 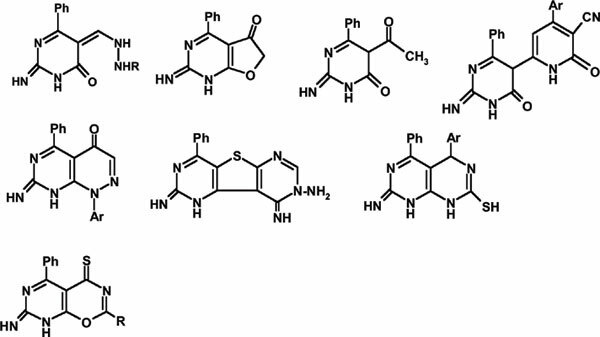 Conclusion: In conclusion, compounds 4, 5 and 12 were used as efficient precursors for the synthesis of new heterocycles including 2-imino-2,3-dihydropyrimidine moiety with expected biological activities. Iminopyrimidine, synthesis, spectral characteristics, antimicrobial activities, fused pyrimidine, heterocyclic synthesis.